Situated one block over from Glasgow’s Queen Street station, right in the heart of the city, Laboratorio Espresso brings a slice of Milanese espresso bar culture to Scotland. It’s a small place, although not quite as small as New York City’s legendary I Am Coffee. For example, there’s enough room for a choice of seating: window bar, tables in the corner, or stools at the end of the counter. There’s even three sets of tables/benches on the pavement outside. One thing it does share with I Am Coffee (other than a passion for coffee), is its height. For such a small shop, it goes a long way up and is easily taller than it is deep. This, coupled with the front wall essentially being one large window, gives it an enormous sense of space out of all keeping with its actual size. The coffee offering is also one you would associate with a large store. With a bespoke espresso blend from nearby Dear Green Coffee and guest roasters from all around the world, Laboratorio Espresso serves up quite a choice, with the option of stove-top espresso for breakfast in the mornings. There’s also a range of cake, soup and sandwiches. October 2015: Laboratorio Espresso has changed its house-blend from Dear Green to Staffordshire’s Has Bean, but still retains its commitment to bringing the best of Europe’s roasters to Glasgow as its guest espressos. Laboratorio Espresso cuts a striking figure on Glasgow’s West Nile Street, its all-glass front punctuating an otherwise bland façade on a street needing its character. Glasgow’s a hilly place though, and West Nile’s no exception. I imagine that it was something of a challenge to ensure that the three sets of tables on the pavement outside were nice and level. The slope’s such that if you sit on the downhill side, you’ll find yourself literally looking up(hill) at the person opposite you! Laboratorio Espresso’s big double doors are slightly offset to the right of centre, so there’s only space for one table to the right of the door, while there are two to the left. Stepping inside, it’s a similar story, with the bulk of the store to your left. In the window there’s a bar with four stools, while opposite it, running from roughly opposite the door to the left-hand wall, is the counter. To the right of the door, there’s a niche with a bench (plus generous cushions) and two tables, a four-person one and another for two people. The interior is lovely, all wood panelling and stone tiling, while the counter, with its marble top, is a work of art. The cakes are dead ahead, then comes the till plus grinders and, finally, the espresso machine, beyond which is a small bar area where you can perch on one of two stools and chat with the barista. Behind the counter is a generous work surface where all the food is prepared. Laboratorio Espresso is owned by Scott and Scot (yes, I know, it’s confusing). I met Scot, the head barista, who can be regularly found behind the counter. He told me Laboratorio Espresso was a long time in the making. Like me, he had fallen in love with Italian espresso culture, but it was only after a visit to La Bottega Milanese in Leeds that he was inspired to set up Laboratorio Espresso. Even then, patience was the name of the game; I was following Laboratorio Espresso on social media at least a year before it opened. However, the wait was worthwhile. 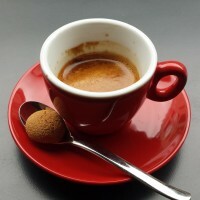 As the name suggests, the focus is on espresso, although in the morning you can have a moka pot, plus a glass of juice and toast (with butter and jam). All the cakes and pastries (of which there’s a large selection that sadly I didn’t get to sample) are also Italian in origin/inspiration, while there are sandwiches and soup at lunch. However, I digress. What a good decision: it was awesome! A smooth coffee, with a lovely mouth feel and no hint of bitterness, it didn’t have the sharp or fruity notes that I dislike: one of the best espressos I’ve had this year! This entry was posted in Breakfast, Cafes, Cake, Glasgow, Laptop Friendly, Lunch, Stations Nearby and tagged include by Brian Williams. Bookmark the permalink.